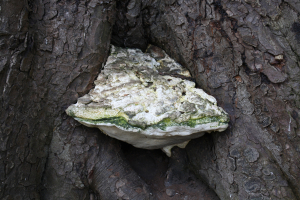 Observation - Hoof Fungus - UK and Ireland. Description: Whitetish with grey colouring. Firm to touch not soft. Quite large, growing from lower trunk of tree. Whitetish with grey colouring. Firm to touch not soft. Quite large, growing from lower trunk of tree.